Adams–Oliver syndrome (AOS) is a rare developmental disorder with cutaneous, skeletal, cardiovascular, and neurological manifestations. Aplasia cutis congenita of the scalp vertex is the most common skin manifestation, and reported skeletal features of the syndrome are the terminal transverse limb defects manifested as amputations, syndactyly, brachydactyly, or oligodactyly. Cutis marmorata telangiectatica congenita, pulmonary hypertension, portal hypertension, and retinal hypovascularization are frequently observed vascular anomalies. In some cases, neurological problems as well as cardiovascular defects have been described which were attributed to mutations in NOTCH1. Adams and Oliver were the pioneers to describe the syndrome as an autosomal dominant disorder. Nevertheless, sporadic occurrence has been described. Six genes have been linked to AOS; mutation of any of them can cause the syndrome. However, in some cases, the genetic cause is unknown. 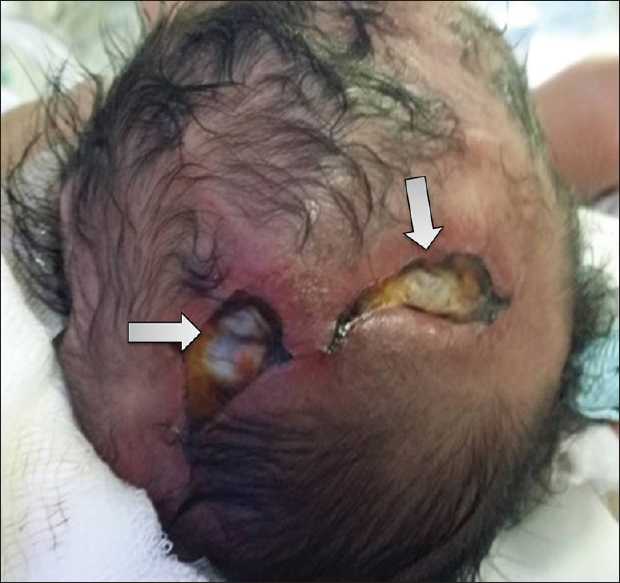 A 2-day-old female infant admitted to the neonatal intensive care unit at King Fahad Armed Forces Hospital southern region, Saudi Arabia, for scalp lesions and limb deformities. She is the fourth child for her parents who are first-degree relatives. She was a full-term baby, born through a normal vaginal delivery with a birth weight of 2.6 kg. Her mother had hypothyroidism treated with oral thyroxine 25 mg/daily. She had seven previous pregnancies; the first four were the first-trimester abortions with an unidentified cause, and the next three were normal. 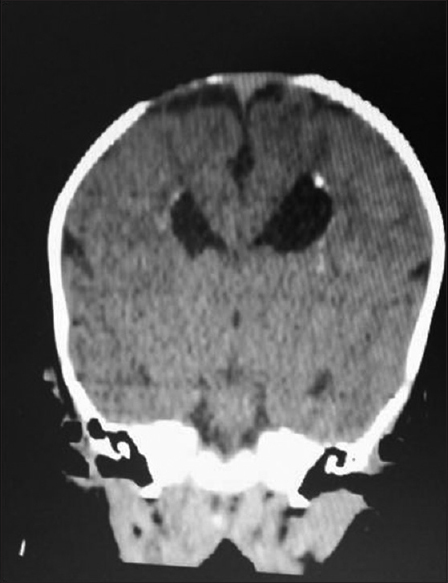 On examination, two scalp defects (cutis aplasia) were identified [Figure 1]. 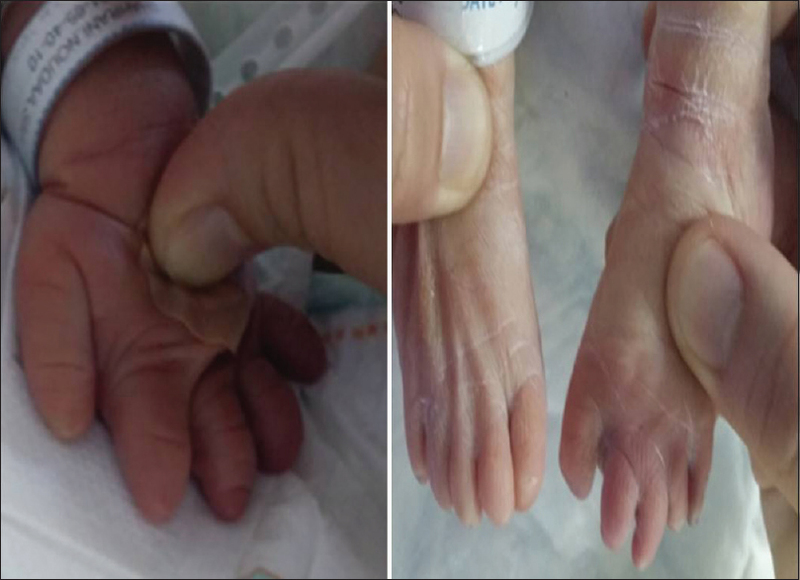 All fingers and toes showed brachydactyly [Figure 2]. Localized cutis marmorata on the lower part of the abdomen [Figure 3] was observed. Eye abnormalities identified on ophthalmologic examination included bilateral corneal detachment and chorioretinitis, defects that resulted in blindness. The echocardiogram displayed patent ductus arteriosus, and head computed tomography showed bone defect at both parietal and parasagittal bones [Figure 4]. Complete blood counts and liver and renal function tests were normal. Her scalp ulcers healed with scarring following 3-week treatment with local dressing and topical 2% fusidic acid cream. Genetic study was done in Bioscientia Institute for Medical Diagnostics, Germany. The baby is a unique case of AOS carrying both the homozygous DOCK6 mutation c.1362_1365delAACT (autosomal recessive) and the heterozygous variant c.1963A>C in the DLL4 gene (autosomal dominant). AOS was initially described in 1945 by Adams and Oliver as combination of limb abnormalities and scalp defects. Vascular, neurological, and congenital heart defects have been reported. The clinical diagnosis of AOS depends on the presence of major and minor criteria. The major criteria include terminal transverse limb defects, aplasia cutis congenita, and family history of AOS. The minor criteria include cutis marmorata, congenital heart defects, and vascular anomalies. The presence of two major criteria or combination of one major and one minor criterion are sufficient for the diagnosis. Our case has two major (limb defects and aplasia cutis congenita) and three minor criteria (cutis marmorata, cardiac defect, and vascular anomalies). The limb and scalp defects are typical clinical manifestations. The most frequently reported are syndactyly, brachydactyly, oligodactyly, polydactyly, and hypoplastic nails followed by scalp defect, generally in vertex area with or without underlying skull defect. Reported ophthalmic involvement in AOS includes neovascularization of the retina, peripheral retinal ischemia, optic atrophy, and rarely retinal detachment., Our patient had a rare presentation of bilateral retinal detachment associated with complete blindness, and sequelae consistent with the associated microvasculopathy reported in patients with the syndrome. To a large extent, AOS has an autosomal dominant mode of inheritance although autosomal recessive and sporadic cases have been reported., As our patient had no family history of a similar condition, it can be considered as a sporadic one with unique genetic inheritance. In the past few years, mutations in six genes have been described as a cause of AOS [Figure 5]. NOTCH1, EOGT, and RBPJ are all members of the NOTCH signaling pathway. NOTCH signaling is activated by two families of ligands, namely, Jagged (JAG1 or JAG2) and Delta (DLL1, DLL3, or DLL4). Of these, DLL4 has an essential role in vascular development and angiogenesis, which places it as a prime candidate for AOS, due to the presence of cardiovascular features in AOS-affected individuals. Molecular genetic analysis in our patient showed a homozygous DOCK6 mutation c.1362_1365delAACT and a heterozygous missense mutation in DLL4 gene c.1963A>C leading to substitution of isoleucine by leucine at position 655 of the protein (p. IIe655 Leu); both findings were consistent with recently reported cases of the syndrome.,, The patient uniquely carries both the homozygous DOCK6 (autosomal recessive) mutation and the heterozygous variant in the DLL4 gene which are transmitted as autosomal dominant trait of the syndrome. Snape KM, Ruddy D, Zenker M, Wuyts W, Whiteford M, Johnson D, et al. The spectra of clinical phenotypes in aplasia cutis congenita and terminal transverse limb defects. Am J Med Genet A 2009;149A: 1860-81. Stittrich AB, Lehman A, Bodian DL, Ashworth J, Zong Z, Li H, et al. Mutations in NOTCH1 cause Adams-Oliver syndrome. Am J Hum Genet 2014;95:275-84. Temtamy SA, Aglan MS, Ashour AM, Zaki MS. Adams-Oliver syndrome: Further evidence of an autosomal recessive variant. Clin Dysmorphol 2007;16:141-9. Seo JK, Kang JH, Lee HJ, Lee D, Sung HS, Hwang SW, et al. Acase of Adams-Oliver syndrome. Ann Dermatol 2010;22:96-8. Bakry O, Attia A, El Shafey EN. Adams-Oliver syndrome. A case with isolated aplasia cutis congenita and skeletal defects. J Dermatol Case Rep 2012;6:25-8. Algaze C, Esplin ED, Lowenthal A, Hudgins L, Tacy TA, Selamet Tierney ES, et al. Expanding the phenotype of cardiovascular malformations in Adams-Oliver syndrome. Am J Med Genet A 2013;161A:1386-9. Verdyck P, Holder-Espinasse M, Hul WV, Wuyts W. Clinical and molecular analysis of nine families with Adams-Oliver syndrome. Eur J Hum Genet 2003;11:457-63. Mempel M, Abeck D, Lange I, Strom K, Caliebe A, Beham A, et al. The wide spectrum of clinical expression in Adams-Oliver syndrome: A report of two cases. Br J Dermatol 1999;140:1157-60. Peralta-Calvo J, Pastora N, Casa-Ventura YG, Hernandez-Serrano R, Abelairas J. Peripheral ischemic retinopathy in Adams-Oliver syndrome. Arch Ophthalmol 2012;130:1078-80. Sukalo M, Tilsen F, Kayserili H, Müller D, Tüysüz B, Ruddy DM, et al. DOCK6 mutations are responsible for a distinct autosomal-recessive variant of Adams-Oliver syndrome associated with brain and eye anomalies. Hum Mutat 2015;36:593-8. Becker R, Kunze J, Horn D, Gasiorek-Wiens A, Entezami M, Rossi R, et al. Autosomal recessive type of Adams-Oliver syndrome: Prenatal diagnosis. Ultrasound Obstet Gynecol 2002;20:506-10. Southgate L, Machado RD, Snape KM, Primeau M, Dafou D, Ruddy DM, et al. Gain-of-function mutations of ARHGAP31, a cdc42/Rac1 GTPase regulator, cause syndromic cutis aplasia and limb anomalies. Am J Hum Genet 2011;88:574-85. Meester JA, Southgate L, Stittrich AB, Venselaar H, Beekmans SJ, den Hollander N, et al. Heterozygous loss-of-function mutations in DLL4 cause Adams-Oliver syndrome. Am J Hum Genet 2015;97:475-82. Shaheen R, Faqeih E, Sunker A, Morsy H, Al-Sheddi T, Shamseldin HE, et al. Recessive mutations in DOCK6, encoding the guanidine nucleotide exchange factor DOCK6, lead to abnormal actin cytoskeleton organization and Adams-Oliver syndrome. Am J Hum Genet 2011;89:328-33. Hassed SJ, Wiley GB, Wang S, Lee JY, Li S, Xu W, et al. RBPJ mutations identified in two families affected by Adams-Oliver syndrome. Am J Hum Genet 2012;91:391-5.